Karuturi Global Ltd., an Indian food processor, plans to exploit East Africa’s market potential by selling crops grown on land leased from Ethiopia’s government within the region, Chief Executive Officer Sai Ramakrishna Karuturi said. The company, based in Bangalore, will produce commodities including palm oil, sugar and rice on 312,000 hectares of rented land. The intention is to sell the crops within the 19-member Common Market for Eastern and Southern Africa, Karuturi said in an interview on Nov. 10 in Addis Ababa, the capital. Neighboring and regional countries are increasingly becoming the largest buyers of Ethiopian goods, according to Access Capital. Somalia and Sudan, for example, are both individually larger export markets for Ethiopia than the U.S., Italy, or Great Britain, the Addis Ababa-based research company said in a report last month. Karuturi has an agreement to provide 40,000 tons of rice to neighboring Djibouti and a proposed Comesa customs agreement may lead to domestically produced rice gaining preferential access to Kenya, he said. The company also sees “large potential” in the Ethiopian palm oil, rice and sugar market. Average annual sugar consumption in the country is 6 kilograms (13.2 pounds) per capita, compared with 30 kilograms internationally. “There are still a lot of Ethiopians who don’t know what sugar tastes like,” Karuturi said. Rice consumption may expand to 100,000 tons from 22,000 tons “if I can deliver rice at 10 birr ($0.61) a kilogram,” he said. Per capita edible oil consumption is also relatively low in Ethiopia, according to Karuturi. The intention is to sell the 80,000 tons of palm oil produced on an Ethiopian market that he expects to expand threefold to 300,000 tons per year. Ethiopia plans to rent out 3 million hectares (5 million acres) of land, an area the size of Belgium, over the next five years to private investors to grow cash crops and generate foreign exchange, the Agriculture Ministry said last month. 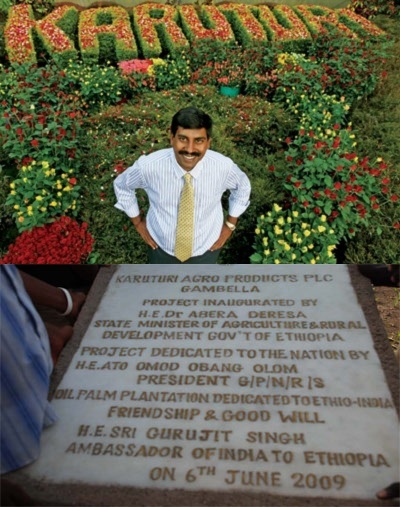 Karuturi plans to have a third of its 300,000-hectare plot in Gambella, in western Ethiopia, developed by April 2013 and the whole farm ready for planting by April 2015, the CEO said. The company has invested $90 million dollars in the project so far and has budgeted a further $260 million, he said. Water is abundant in Gambella and the company will build its own irrigation and energy infrastructure rather than rely on an “over-burdened government,” Karuturi said. Two tug boats have been purchased to transport goods via the Baro River to destinations including Lake Victoria on the Ugandan border and Port Sudan on the Red Sea coast. Critics of Ethiopia’s land leasing program have said the process has displaced residents. Solidarity Movement for a New Ethiopia, a Washington-based advocacy group, said the government has told many people in Gambella they will be removed from their homes to make way for the Karuturi farm. Ethiopia is Africa’s second-most populous nation, with about 80 million inhabitants, according to the U.S. State Department’s website.